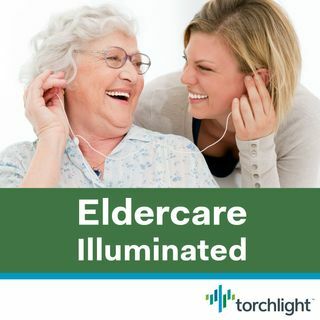 Join this episode of Eldercare Illuminated to learn more about hospice — what is on offer for patients and their families. Not just for cancer patients, hospice services can make the end-of-life experience less scary and more comfortable for everyone involved. A hospice team typically includes family members, a hospice physician, hospice nurse, social worker, aides, chaplain, bereavement counselors, and volunteers. This rich conversation about how hospice works, when it makes sense to ... See More involve a hospice team, and what to expect is eye-opening. A better understanding of hospice makes it easier for families to reach out when a loved one is nearing end of life. Beth Rubio, MSW, LICSW is a medical social worker who has worked with seniors and their families for over 30 years. As a hospice social worker, she has extensive knowledge about end-of-life care and the many aspects of both the patient’s and the family’s lives that are enhanced by special attention to social, emotional, spiritual, and medical care. In her day-to-day work, Beth focuses on increasing a sense of wellness, reducing stress, and honoring each individual’s unique life journey. Beth has an undergraduate degree in psychology from Saint Michael's College and a Masters in Social Work from the Boston College Graduate School of Social Work.